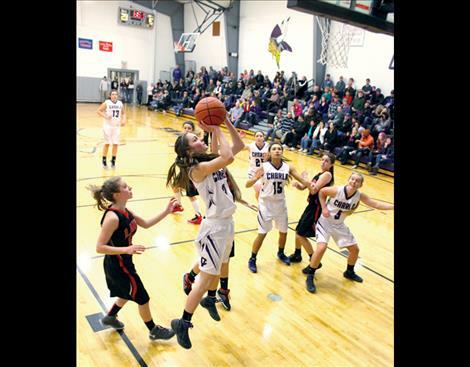 Kent Luetzen/Valley Journal Cheyagy flies to the hoop as her teammates box out their opponents. With a current season record of 7-1, the Charlo Lady Vikings’ head coach Bret Thompson is pleased with the first part of this season. What’s even better is that the strengths of his team seem to be evenly distributed among the players. Junior Cheyenne Nagy was a Second Team All Conference player last year and with one more year of court experience, results are showing. Along with her are District Honorable Mentions, seniors Mikaylan Roylance and Skyler Frame. With an experienced and athletic squad, the girls are working on maintaining consistency throughout an entire four quarters. With Friday night’s non-conference victory over Missoula Hellgate’s sub-varsity team and Saturday night’s non-conference win over Darby, the Lady Vikings continue building a solid game on both ends of the court. “I would like to see us continue to win and stay healthy so that we have a chance towards the end of our season,” Thompson said. Roylance, Lady Vikings’ top scorer in Saturday night’s game, is excited to see younger players making contributions. In addition to Roylance, Nagy, and Frame, other supporting players include post Ashley Tryon, forward Brooklyn Foust, and freshmen Allie Delaney and Tyra Hammond. With the first half of the Lady Vikings’ season almost in the books, the team is looking forward to season high performances. “We want to hit our peak at the end of the season,” said Nagy. With a 39-28 win over Darby Saturday, Jan. 9, the Lady Vikings showed their level of athleticism and teamwork, with six of the players putting up points. Roylance led the team with 10 points, followed by Nagy and Foust each with 9. Ashley Tryon had 6 points, while Skylar Frame and Allie Delaney combined with 5. Thursday’s home game against rival Arlee — who beat Charlo in the District Championship last year — should be a good indication how well the Lady Vikings’ can improve upon last year’s end-of-season ranking. Following Thursday’s game is another home match-up against Hot Springs on Friday, Jan. 15. Charlo Lady Vikings’ Senior Recognition Night will be held Saturday, Jan. 23. Charlo – Points: Cheyenne Nagy 22, Mikaylan Roylance 9, Ashley Tryon 4, Sakoya Gaustad 4, Brooklyn Foust 2, Telesa Truman 2, Skyler Frame 1. 3-pointers: Nagy 2, Roylance 1. Charlo – Points: Roylance 10, Nagy 9, Foust 9, Tryon 6, Frame 4, Delaney 1. 3-pointers: Nagy 1, Foust 1.